Grilled Vegetable Quinoa Salad- use your favorite seasonal vegetables to make this easy, vegan, dairy free and gluten free side dish! 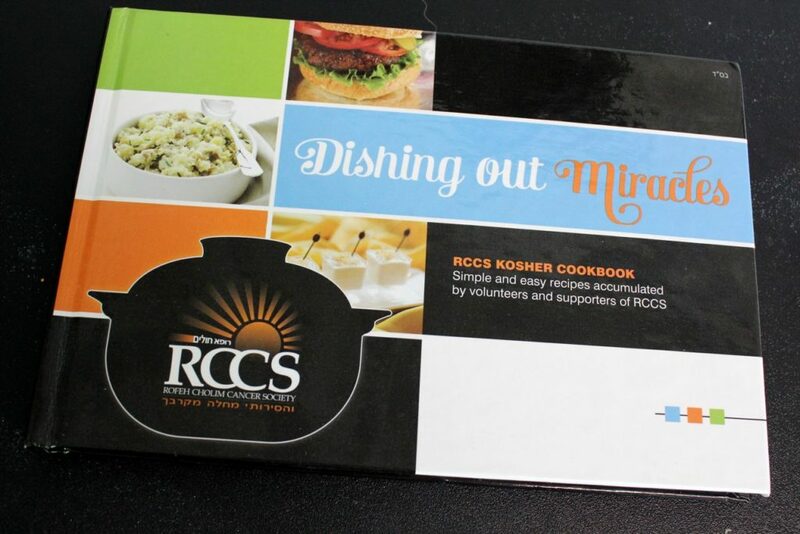 A while back, the lovely folks at RCCS asked me to contribute a recipe (or two) to their first fundraiser for cancer cookbook. I was honored! 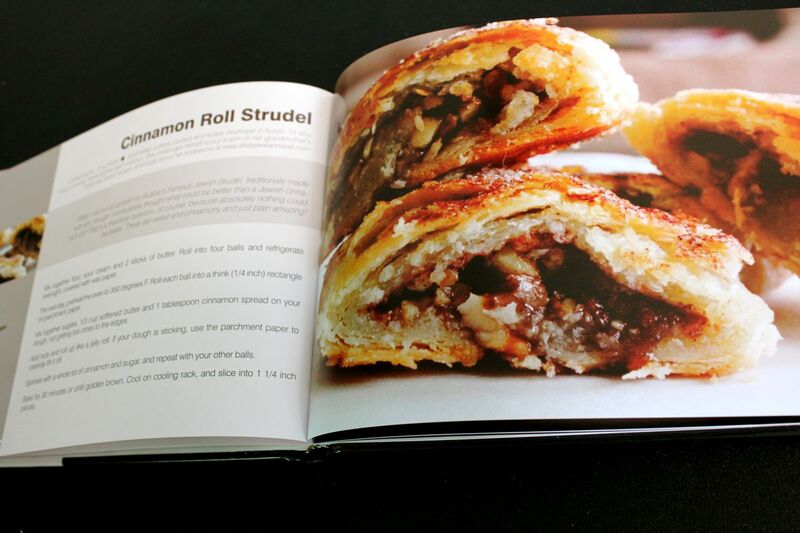 Have a few Jewish recipes published and for a good cause? Sign me up! Plus, this supported why I love to cook in the first place- I do it for the people. Is there any better feeling than cooking up a tasty meal for a new beau (yes I said beau) and they LOVE it?! Or cheering up a friend with some homemade cupcakes? Or slaving away in the kitchen all day, so you can relish in a tasty meal, hearty wine, and great conversation? I don’t think so! 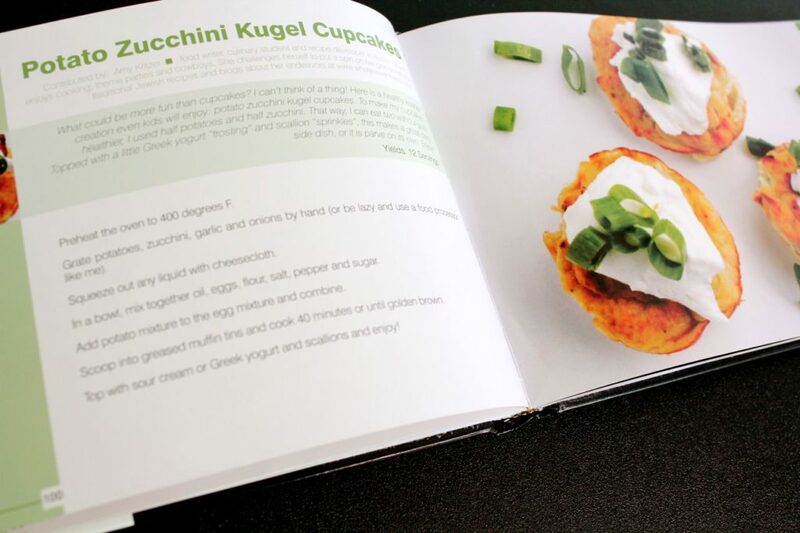 I forwarded them my potato zucchini kugel cupcakes and cinnamon roll strudel and a little bit later received their cookbook in the mail. Cute right? Being the narcissist that I am, I immediately flipped to find my recipes. Success! My they look tasty in print. Then, of course, I perused the rest of the cookbook. It is chock full of tasty sounding recipes like s’mores brownies, brown sugar candy chicken, Moroccan meat cigars (does that one sound dirty to anyone else? Tasty, sure, but dirty.) and even adult beverages like a boozy hot chocolate! Don’t fear, you can get one of your very own here! There were so many recipes I wanted to try, but one in particular sounded right up my alley. My blog friend Miriam’s Grilled Vegetable Rice Salad! 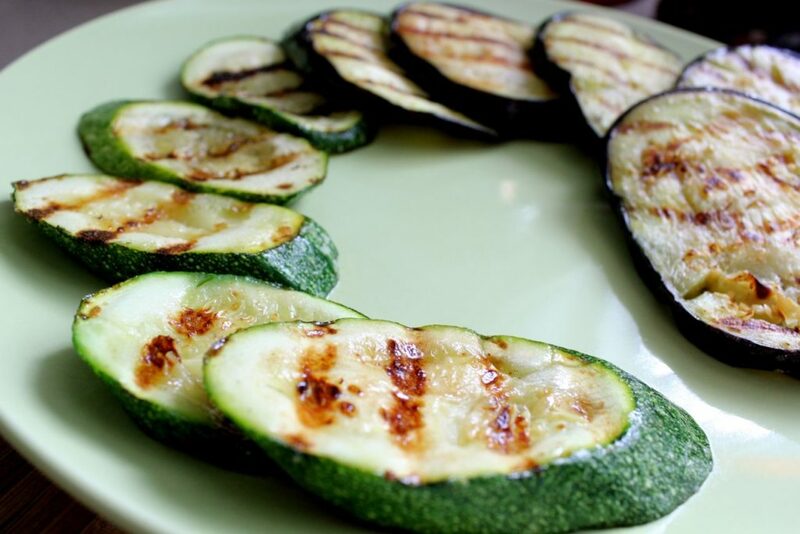 Incorporating grilled veggies into a salad sounded like the perfect side dish for summer! Plus the tangy mustardy dressing sounded delicious. I made a few changes starting with using quinoa instead of brown rice, because it’s pretty freaking tasty! I also changed up the types pepper, vinegar and oil. What I love about this recipe is it is so flexible, so use what Jew got! 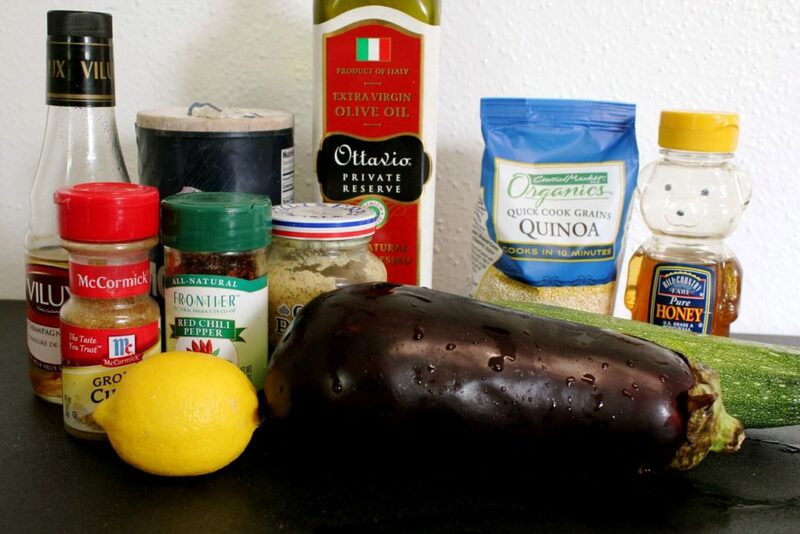 Here is all I used to make my adapted Grilled Vegetable Quinoa Salad. First up, cook your quinoa. I put 2 cups dried quinoa and 3 cups of water in a pot and brought it to a boil. Then I covered it and lowered the heat and simmered for 10 minutes until done! 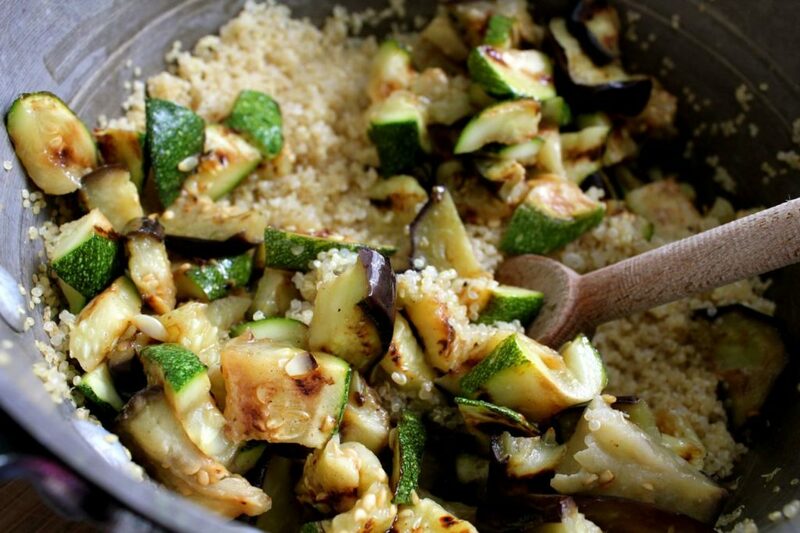 While your quinoa is cooking, slice your eggplant and zucchini and toss in olive oil and salt. Then grill until tender. If you don’t have a grill you can saute, roast or use a grill pan like me! Just look at those pretty grill marks! 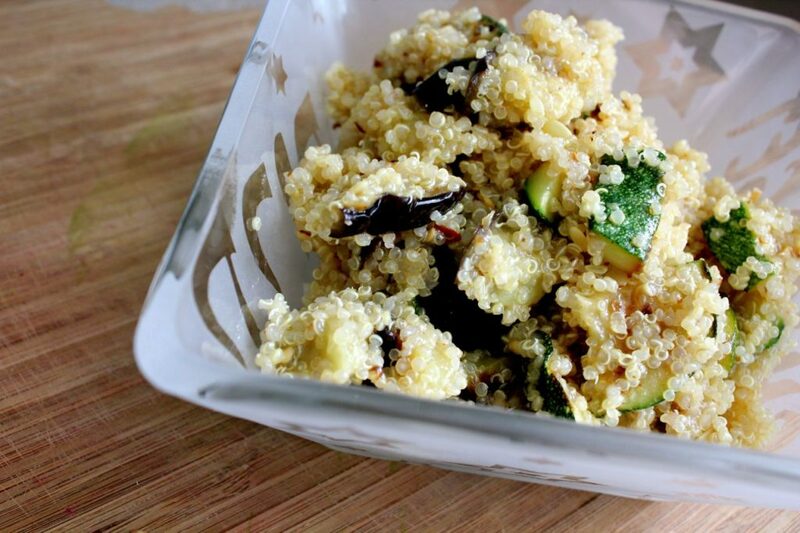 Let the quinoa and vegetables cool slightly and cut the veggies into large chunks. Then make the dressing. 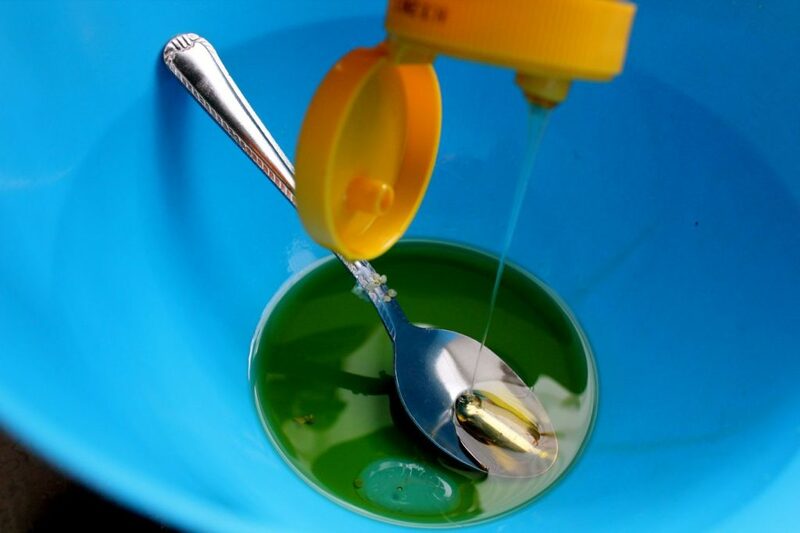 Combine olive oil, mustard, honey, vinegar, lemon juice, cumin, salt, and red chili pepper flakes and whisk together. 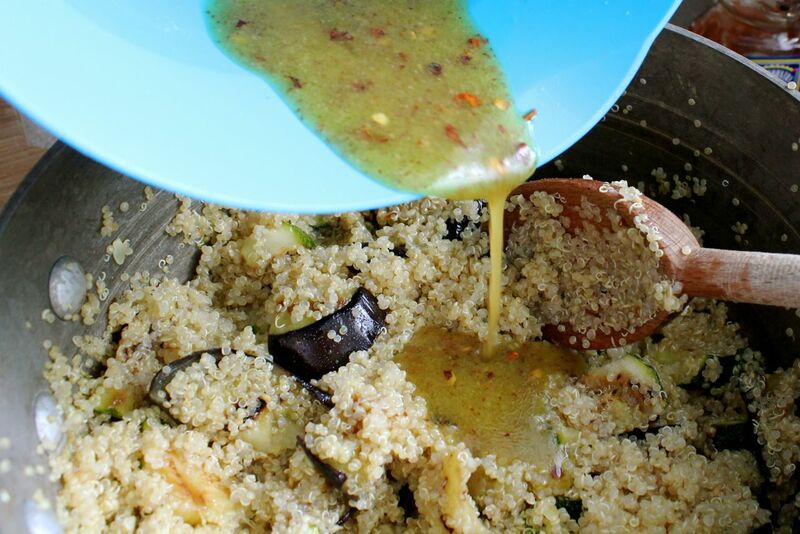 Then just combine quinoa, veggies and dressing and you are good to go! Adapted from Grilled Vegetable Rice Salad from Overtime Cook. 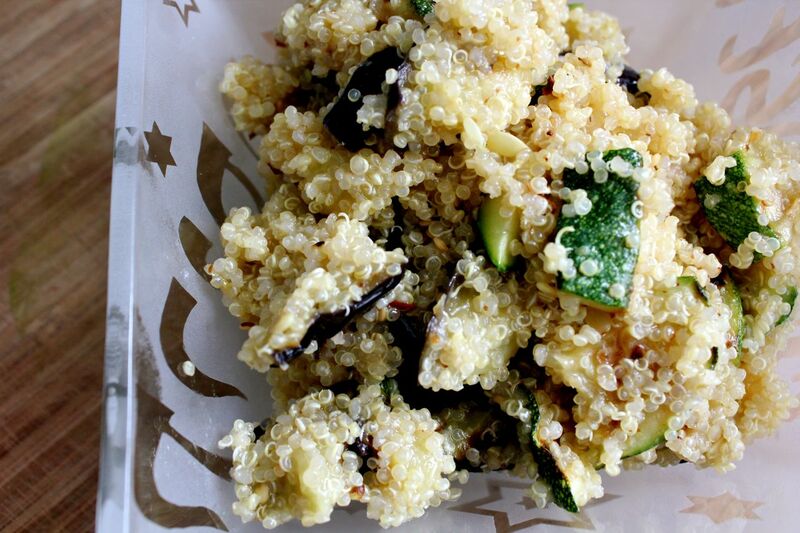 A tasty quinoa side dish in a tangy dressing perfect for summer BBQs. 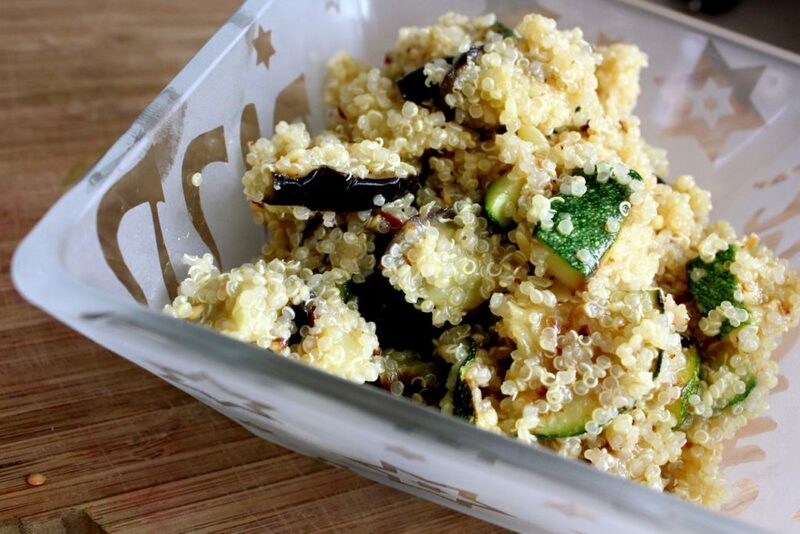 Cook your quinoa. 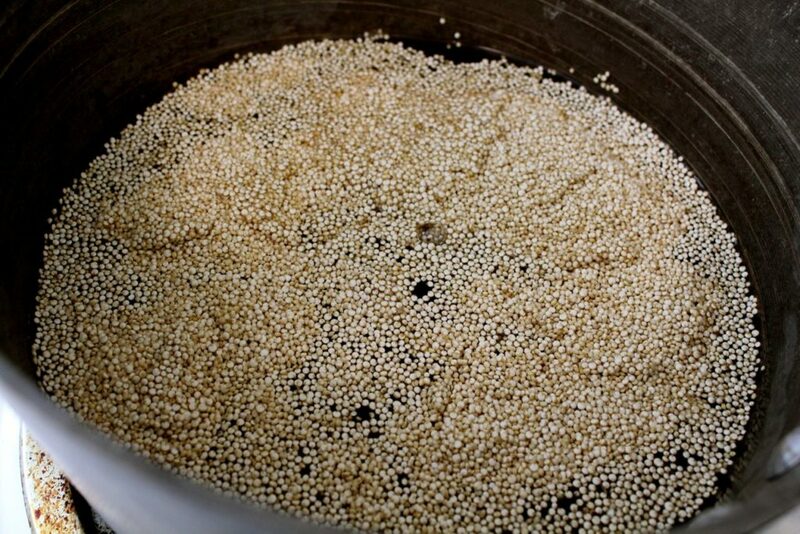 Put 2 cups dried quinoa and 3 cups of water in a pot and bring it to a boil. Then I cover the pot and lower the heat and simmer for 10 minutes until done! 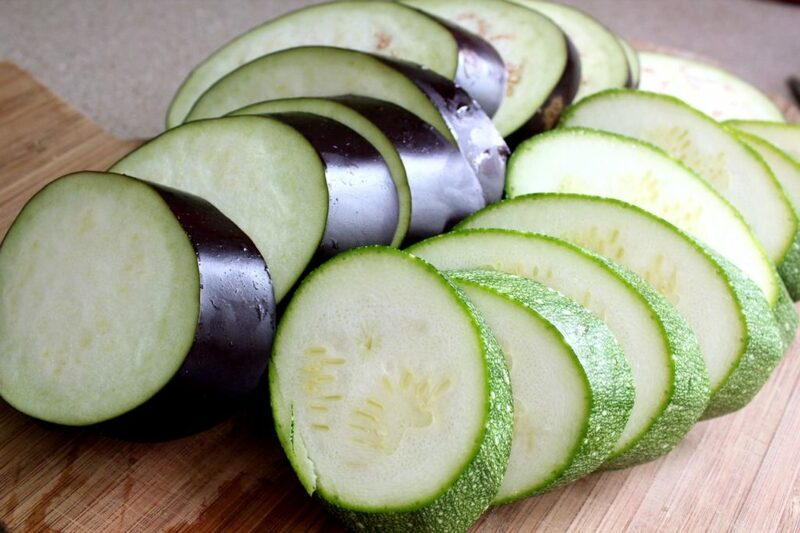 While your quinoa is cooking, slice your eggplant and zucchini and toss in 2 tablespoons olive oil and ½ teaspoon salt. Then grill until tender. 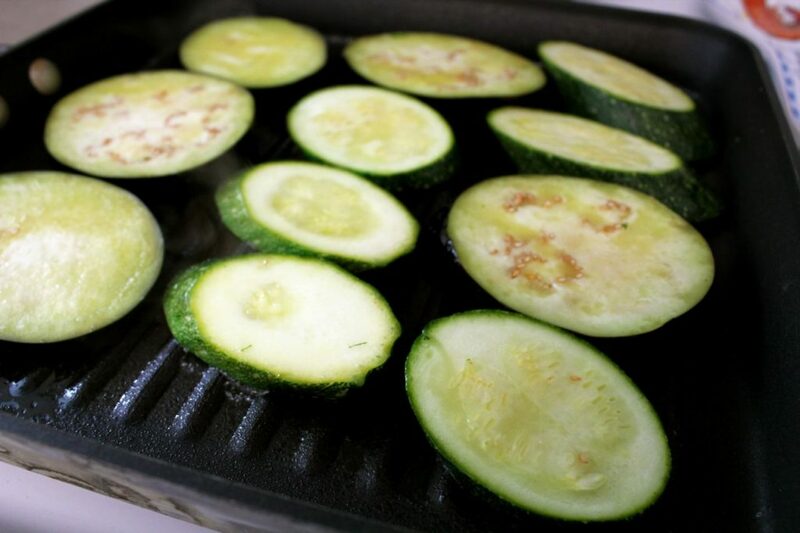 If you don’t have a grill you can saute, roast or use a grill pan! It is embarrassing to drool at my age – they think there is something wrong with me, but I just love your cooking!!!! Can’t fault a bubbe for that!!! Bubbe you even make drooling look cute! Yay glad you like the change! I have been obsessed with quinoa lately. Thanks for the recipe- it is delish! These pictures are so clear and large, wish I could eat those zucchinis straigh from the screen (that will be possible onde day, won’t it? Thanks! I certainly thought by 2012 we would be able to eat food off a screen, and teleport.